This story starts a few years back. 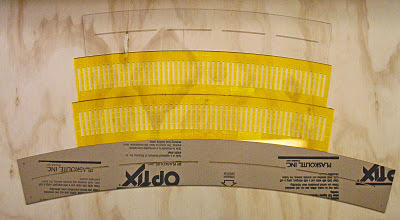 On one of the layout tours associated with the 2008 O Scale National convention, I was at a huge P48 layout when I spotted some curved track-laying and turnout templates done in bright yellow acrylic. The templates had cutouts for the individual ties as well as gauge lines for the rails. They were marked Canter Rail Services and I thought that it was a neat tool; but since this was a very busy open house, and I did not even know who the host was, I could not ask about them. After the convention I searched for a "Canter Rail Services", but I could not find any reference to them. Fast forward a couple of years to a O Scale train show in 2010 where I saw some of these templates lying on one of the sales tables. I inquired of the vendor and it was Jim Canter himself. It seems that he was not going to make these any longer and the stock on the table were all that was left. There were two templates for radii that I was using, so I bought those. 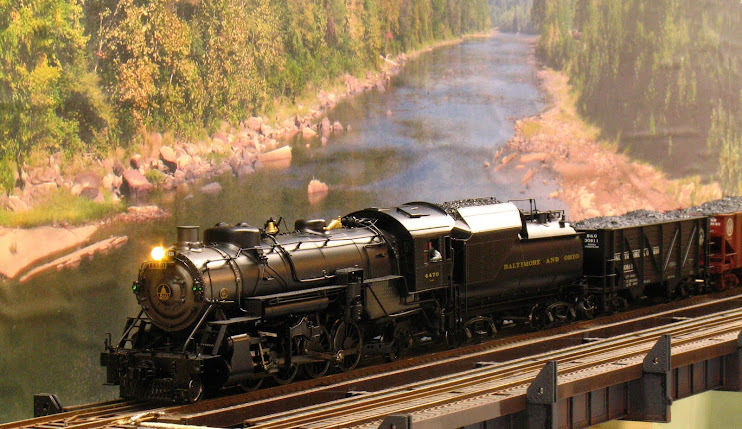 They saw little use in building my railroad as I was still laying-out my curves using a beam compass; and I came to realize that unless I was actually hand-laying track these were less useful than I had first thought. That is, until I was building the part of the Cheat River Grade beyond the Tray Run Viaduct. In that area, I could not use the beam compass to lay out the curves as the pivot point of the beam would have had to be located on the other side of a stud wall. I pressed the little-used Canter templates into service and, although they were not perfect for this task, they worked well enough to make me consider giving up the beam compass. So as I contemplated laying out the last two mainline curves on the layout I determined to make some more templates to facilitate this task. I decided on using a laser cutting service to cut the templates out of acrylic, just like the originals. However, I would redesign the templates to facilitate laying flex track as I was doing. The first task was to design the templates in CAD. I used TurboCAD Delux. I've had various versions of TurboCAD since about version 5. It's not the easiest CAD program in the world to use, but it has the virtue of being cheap if you buy an older version. Google Sketch-Up would probably suffice and it's free. I began by laying out a 72" radius template similar to the Canter ones. 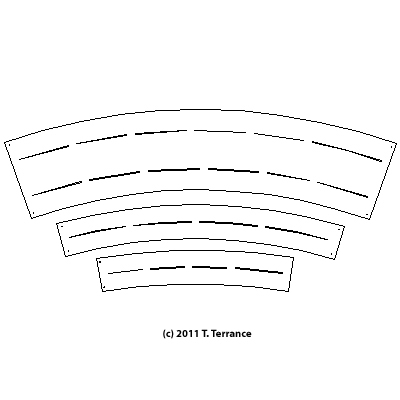 The Canter templates have the outer edge 2" longer than the marked radius and the inner edge 2" shorter than the marked radius so that when two templates of different radii are butted adjacent to one another the track center spacing is set for the nominal 4" for O scale. I followed suit on my 72' radius template. I did not need the slots for the individual ties and cutting them on the laser cutter would be very expensive. What I did need was a slot down the middle, on the track radius, to mark the track center line. I layed-out a 0.080 inch slot down the center of the template on the 72" radius. The 80 thousandths slot would accommodate a pencil, pen or a Sharpie marker. In the corners of the Canter templates are four holes to allow the template to be fastened down; I replicated these holes. I sized the template to fit one of the standard sized sheets of acrylic that the laser cutting service provided. The result is shown below. I sent this design to the laser cutting service to obtain a price. The cost of cutting this template was reasonable, less than the cost of the original Canter templates. That caused me to think about the large two-turn helix in the center of my layout. I had been contemplating how I was going to cut each segment of the sub roadbed of this large spiral. I had wanted to have the sections cut on a CNC router, but I could not find such a service near enough to where I live to make it economically feasible; and shipping 20 or so sections made of 3/4" plywood would be very expensive. I could make a template and cut the sections out myself. However, besides being very time-consuming, I did not think that I could make a template accurate enough that it would result in a accurate two-turn helix. Laser cutting the template would remove that last consideration. There are two tracks on my helix so I had to lay out a double-wide template with center lines for two tracks. I increased the track center-to-center distance to 4.5 inches to allow for the boiler swing of the articulated locomotives that I will be running. While I was at it, I increased the width of the template to 9.5 inches, 2.5 inches beyond the outer track center line and 2.5 inches inside the inner track center line - also for boiler swing. I sized the template to fit the short dimension of a 4x8 sheet of plywood to maximize the number of segments that I could cut from a single sheet. These are, from the top, the double track helix template, the 60" radius template and the 72" radius template. As this was my first foray into designing for laser cutting I was anxious to see how these templates came out. 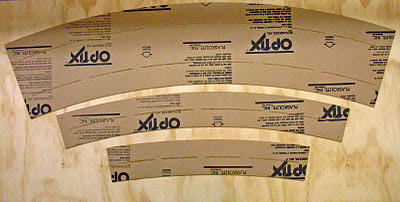 The three templates as they came from the cutter are show below. I was impressed with the finish on the cut edges, they are almost polished by the laser. In the next picture, I have fitted the 72" and 60" to the 64" and 68" Canter templates; they fit together perfectly. I had removed the protective paper from the 72" template before I realized that it would photograph poorly without it. Today I bought some lumber to begin using the helix template to cut the sections for the helix. Hopefully, I'll be ready to begin building the helix by Christmas. Nice work Terry. You have a lot of well thought out solutions (or remakes, in this case) using good materials.